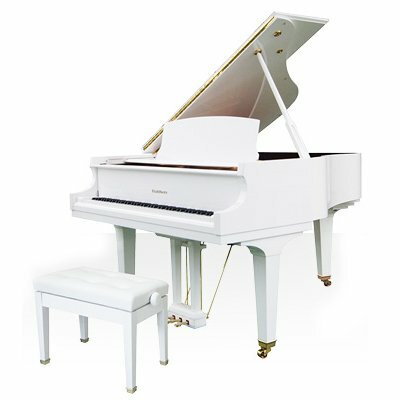 Any time you buy a Baldwin grand piano you expect a beautiful and classic cabinet design along with warm tone and exceptionally responsive action. These features are in abundance in the new BP148. To ensure integrity, each part of this grand is carefully chosen for its uniformity and performance. The soundboard and rib material are made from solid Alaskan Sitka spruce, while the bridge is made from hard maple and precision notched by hand. 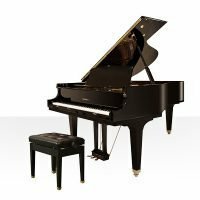 Each key is crafted of solid Alaskan Sitka spruce with ebony wood sharp keys, and individually weighted for the most responsive action possible. Abel German hammers sound high-quality Roslau strings, and a 17-ply hard maple pin block offers a lifetime of precision performance. 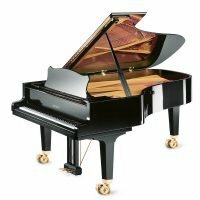 The three traditional pedals – soft, sustain and sostenuto – are constructed of solid brass, and the fallboard utilizes a slow-close mechanism for a smooth, sure motion when in use. This makes it easier and safer for younger players.